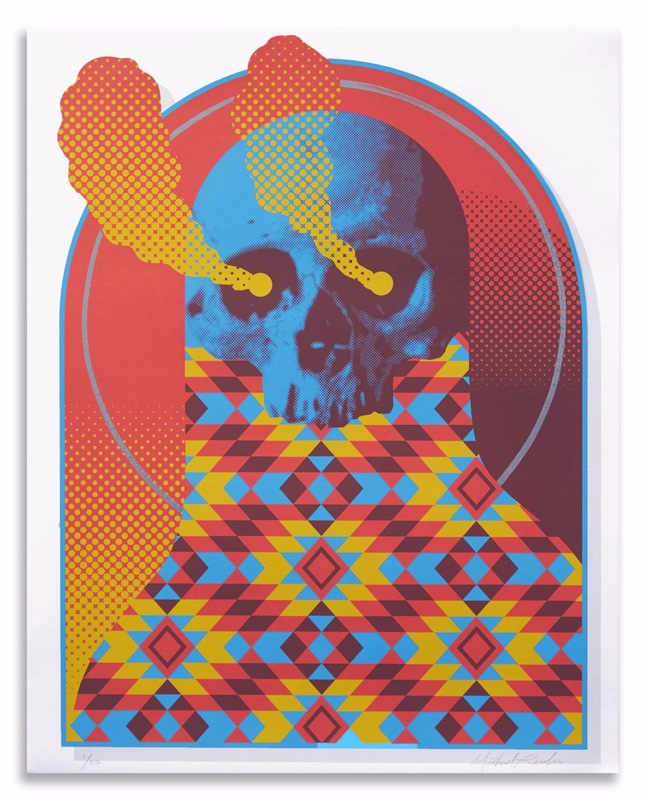 Jonathan LeVine Projects is launching a new line of limited edition prints and is kicking things off with this beautiful hand embellished “Fire Spirit” screen print by Los Angeles based artist Michael Reeder. Reeder is best known for his striking figurative paintings composed of flat patterns, bold colors and realism, all intertwined within an ominous undertone. The Blot’s really digging this new piece, especially its dot effects, which to me harkens back to the 4 color dots printing of old school comic books. Fire Spirit is a 28”x22” hand embellished with silver Krink marker 5 color screen print on Coventry Rag 335gsm paper. Limited to just 50 pieces (and 5 APs), this signed and numbered print can be purchased now at the Jonathan Levine Gallery online store for $175.